Davis, D.s.. "John Brant (Ahyonwaeghs)". The Canadian Encyclopedia, 23 May 2018, Historica Canada. https://www.thecanadianencyclopedia.ca/en/article/john-brant-ahyonwaeghs. Accessed 18 April 2019. John Brant (Ahyonwaeghs), Mohawk Grand Chief, Indian Superintendent (b near Brantford, Ont, 27 Sep 1794; d there 27 Aug 1832). John Brant was the son of Joseph Brant, Mohawk chieftain and the first Aboriginal to receive a commission in the British Army, as a captain in 1757. John Brant (Ahyonwaeghs), Mohawk Grand Chief, Indian Superintendent (b near Brantford, Ont, 27 Sep 1794; d there 27 Aug 1832). John Brant was the son of Joseph Brant, Mohawk chieftain and the first Aboriginal to receive a commission in the British Army, as a captain in 1757. John was also the nephew of Robert Johnson Kerr, who was the son of Major General Sir William Johnson and brother-in-law of Joseph Brant. 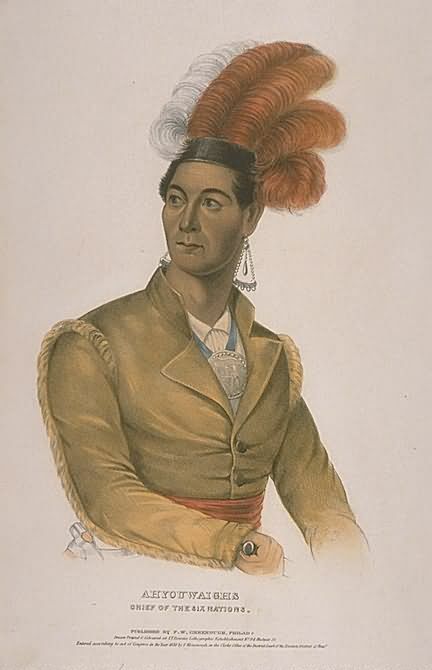 John Brant was a loyal friend and supporter of John Norton (c.1760-1831), who was chosen by Joseph Brant as a War Chief. At age 18, Brant and Norton led the Mohawk at the Battle of Queenston Heights during the War of 1812, where the Mohawk counter-attack proved decisive. During the battle, John Brant captured the later renowned American officer, Colonel Winfield Scott. Brant (commissioned as a lieutenant) and Norton (a major) commanded the Mohawk during the failed defence of Fort George. Brant fought in the Battle of Beaver Dams, on 24 June 1813, alongside Norton and Kerr. At the Battle of Chippawa, the Mohawk faced not only American troops, but also Seneca warriors. Although members of the Six Nations, the Seneca had chosen to support the United States. 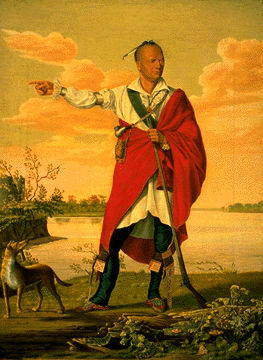 Many of the Grand River Mohawk withdrew from the war after the defeat at Chippawa, but Brant remained loyal to Norton. In 1821, Brant and his brother-in-law William Johnson Kerr successfully campaigned for land rights (Haldimand Proclamation) for the Grand River Mohawk and other Six Nations. The British Indian Department appointed John Brant Resident Indian Superintendent for the Grand River Mohawk in 1828. Brant was elected to the Upper Canada legislative assembly in 1830, the first Aboriginal to sit in the Upper Canada assembly as a member. His election was challenged the following year, and he lost his seat to John Warren. In 1831, John Brant was named as Grand Chief of the Grand River Mohawk (Tekarihoga), succeeding his deceased maternal uncle Henry Crogan.